Education is an effective instrument for combating poverty. It enables people to take their own future and that of their communities into their own hands and thereby creates the basis for a sustainable development process. While access to education has improved impressively in almost all countries in recent years, the quality of education in the Global South often remains alarmingly low according to World Development Report 2018. El Salvador is also struggling with a very poor education system. Teachers often lack adequate knowledge of the subject matter and solid didactic skills and they are overwhelmed with the large and heterogeneous classes, with students at several different learning stages in any given class. As a result, many young people can hardly read, write or do maths once they have finished primary school. 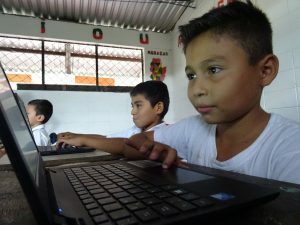 Our new project CAL-IMPACT (Computer-Assisted Learning) wants to show that young teachers in El Salvador – with suitable resources and adequate preparation and support – are quite capable of inspiring children to learn. The project focuses on the maths skills of third to sixth grade children and combines the use of computer software with games, group work and workshop lessons. Thanks to the SDC’s Impact Evaluation Award 2017, CAL-IMPACT is carefully and scientifically evaluated in collaboration with the University of Bern. After collecting and shipping over 700 computers and carefully instructing 40 teachers, the project started on April 16 throughout the department of Morazán. During the year, 2,400 children in almost 30 different primary schools in rural north-eastern El Salvador will participate in additional mathematics lessons that are based on innovative pedagogical methods. With the help of the “Khan Academy” software, students can watch learning videos and solve exercises at their individual level for two afternoons per week. The time at the computer is supplemented by group work and games, so that the social aspect of learning is not neglected. The first impressions at the start of the project are touching: both the Ministry of Education, the children and their parents are enthusiastic about the project. One of the CONSCIENTE teachers sums up his experiences in the CAL project as follows: “In the last few days I have understood something essential: that learning does not have to be boring”. YOUNG TEACHERS WERE TRAINED FOR THE PROJECT. CHILDREN PARTICIPATE IN INTERACTIVE MATHEMATICS LESSONS. COMPUTERS HAVE BEEN SHIPPED TO EL SALVADOR. LESSONS WILL TAKE PLACE IN 2018 AS PART OF THE CAL-PROJECT. Consciente’s work is based on the “innovate, test, then scale” approach. This means that our projects must first pass a trial phase in which they are carefully evaluated using scientific methods. Only if a project proves to be effective will it be continued and expanded. In this way we want to ensure that our work is not only well-intentioned, but actually achieves the desired results. This also applies to our CAL project. 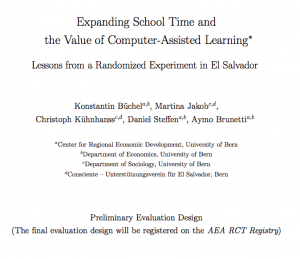 A randomized controlled trial will be conducted to measure the impact of the project on (1) students’ mathematical skills and (2) their educational motivation. In addition, we want to find out which program variant works best. Initially, 200 school classes were randomly divided into four groups: Group 1 (40 classes) receives computer-based mathematics lessons with one teacher, group 2 (40 classes) participates in additional CAL lessons with a technical supervisor (without pedagogical training), group 3 (40 classes) receives mathematics lessons without computers and group 4 (80 classes) does not participate in the project for the time being, as it is a control group. In all groups, a maths test is carried out before and after the project. The impact (“causal effect”) of the project can be estimated by comparing achievements in control and treatment groups. After the exams, the children also complete a questionnaire in which they are asked, among other things, about their motivation for education. In this way, potential effects on this target value can also be identified. The first test was carried out in February 2018 – with 4000 students at almost 60 schools throughout Morazán. With its evaluation design, CONSCIENTE has won the SDC and the ETH Center for Development and Cooperation (NADEL) Impact Evaluation Award 2017, endowed with 50,000 CHF. 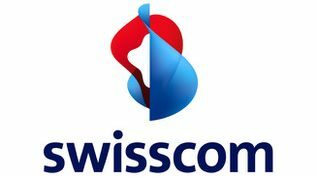 The evaluation is carried out in partnership with the Center for Regional Economic Development and the Institute of Sociology at the University of Bern. After completion of the study, a scientific article and a policy brief will be published.